Meanwhile, San Francisco is suing UrbanCore over an unpaid $5.5 million loan. Since 2015, Oakland’s city council has been negotiating the sale of a valuable slice of city-owned property near Lake Merritt to the developer UrbanCore, which plans to build a market-rate apartment tower on part of the property. UrbanCore won the deal after competitive bidding, partly based on its assurance that it wouldn't require a public subsidy. But the project has missed a major deadline, and now, UrbanCore can’t proceed without a loan from the city. At its meeting earlier this week (which ran into the early hours of Wednesday morning), the Oakland City Council ignored protests from skeptical members of the public and stood by the beleaguered developer by approving the $2.35 million loan. The unusual public subsidy for a market-rate housing project — at a time when the city's market-rate development is red hot — also came with an extension to the project’s timeline of nine months. 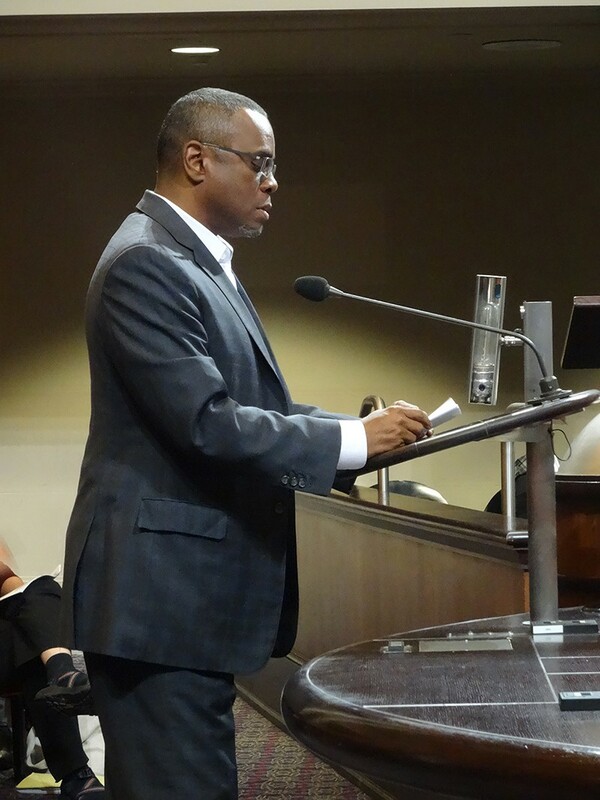 Oakland’s new loan to UrbanCore, which is owned by businessman Michael Johnson, comes at the same time that the city of San Francisco is suing Johnson over an unpaid $5.5 million loan of public funds for a real estate development in the Fillmore neighborhood. “This is an absolute scam,” complained Krishna Desai, an activist with the group Eastlake United for Justice, which has pushed for affordable housing on the E. 12th Street Remainder Parcel. Desai reminded councilmembers early Wednesday that competing proposals submitted in 2016 by other developers were rejected because city staff and councilmembers claimed they would have required greater levels of public subsidy. The other proposals were submitted by affordable housing developers, and the subsidies were for affordable housing, not market-rate housing. At this week’s meeting, Councilmember Rebecca Kaplan raised concerns about UrbanCore’s record in San Francisco. “It’s been brought to my attention that there’s ongoing litigation in San Francisco with this proposer regarding a similar loan term with San Francisco that’s not been repaid, and I wanted to know whether you are aware of that, or concerned about that,” Kaplan asked city staff. Lane said the tenant was Yoshi’s restaurant and club, and that the project in Oakland is substantially different because it’s a loan for a residential project, not a commercial venture. He added that UrbanCore’s financial partners on the project are guaranteeing the loan. According to the lawsuit filed by San Francisco’s City Attorney Dennis Herrera in August, Johnson’s other company, EM Johnson Interest, has never paid back the $5.5 million loan from the city. The city loaned Johnson the money in 2005. By 2010, the city and Johnson attempted to create a “work-out plan” whereby Johnson would repay the loan, but according to Herrera’s lawsuit, “Johnson failed to make all payments and perform all obligations[. ]” In 2015, the city issued a notice of default against Johnson and demanded repayment, but again Johnson failed to pay. According to Herrera, UrbanCore now owes San Francisco $6.5 million for the unpaid loan plus interest. Johnson filed a countersuit against the city in October alleging that it was San Francisco that actually breached the contract by interfering with the project and making it financially infeasible. According to Johnson, the city didn’t allow him to recruit different tenants after Yoshi’s closed it's location there in 2012. Oakland is already providing a loan to UrbanCore's partner, nonprofit developer East Bay Asian Local Development Corporation, to build an attached affordable housing mid-rise on the same East 12th Street site. Under the 2016 deal with the city, EBALDC is assembling financing for the affordable portion of the property. Councilmember Abel Guillen said during Wednesday morning’s meeting that he supports the loan to UrbanCore. He said the overall project, including EBALDC’s portion, includes 30 percent affordable housing out of the total 300 units, and that the city needs to add more housing of all types to address the housing shortage. “We need to move on this project and no longer delay it,” Guillen said. Kaplan voted against the loan while Councilmember Noel Gallo abstained and Councilmember Desley Brooks, a strong supporter of UrbanCore, was absent. Like UrbanCore, EBALDC has fallen behind schedule due to rapidly rising construction costs. Construction at the site, known as the E. 12th Street Remainder Parcel, was supposed to begin last month. The new loan to UrbanCore is required to be repaid in two installments, one upon transfer of the land, and one upon refinancing of the property, which will occur within five years, Lane said during Tuesday’s meeting. The E. 12th Street Remainder Parcel is valued at $8 million. Under terms of the original 2016 deal, $4.7 million was supposed to be paid by UrbanCore with the remaining $3.3 million, representing the portion committed to affordable housing, paid by EBALDC with a loan from the city. Under the new terms of the deal, the city will extend a $2.35 million loan to cover half of Urban Core’s portion as well. Both UrbanCore and EBALDC still need to locate more financing to meet construction costs, according to the city report. UrbanCore and Michael Johnson declined comment for this report. EBALDC did not respond to press requests in time for publication.